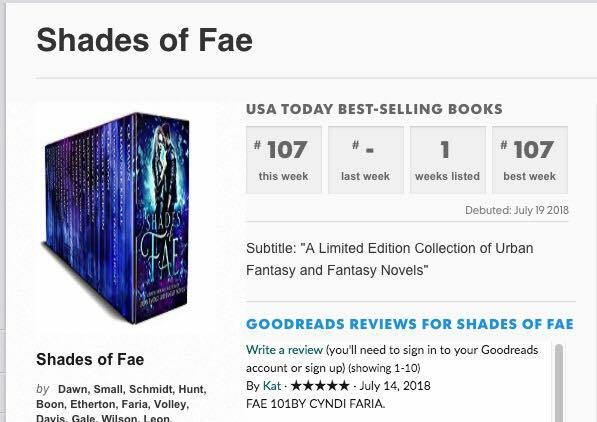 For those who didn’t see the news on my social media feeds last week, the Shades of Fae boxset hit the USA Today Bestsellers list at #107. After months of hard work and dedication, this fantastic group of authors ticked a box on their bucket list and I feel lucky to have had the privilege of working with such a funny and talented lot. They were amazeballs. If you haven’t picked up your copy of Shades of Fae, you still can. It’s available at all major book outlets online although the price has gone up to $2.99 since release week. My new series, The Shaded Veil debuts in this box set and won’t be available as a stand alone until 2019. So if you’re at all interested, now’s the time to pick it up before it’s gone. So now it’s back onto Destroyer for me as we get closer to Dragon Con at the end of August. Enjoy the rest of July, peeps, and as always see you on the other side.